Thor – Courage is immortal. Screenplay by Ashley Miller, Zach Stentz, and Don Payne. Story by J. Michael Straczynski and Mark Protosevich. 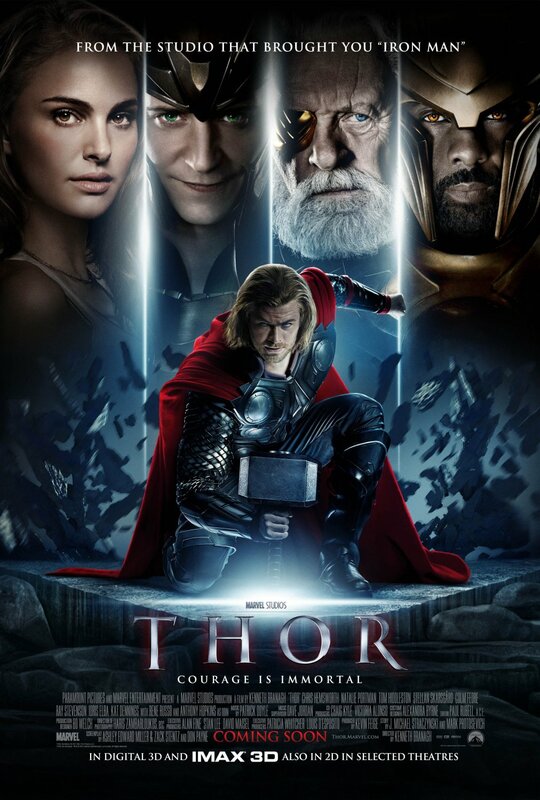 Excellent movie about Thor (Hemsworth) a god from Asgard. Who in his eagerness to prove himself starts a war with the Frost Giants headed by King Laufey (Feore). For his efforts Thor is exiled to Earth where he meets Jane Foster (Portman). There he is reduced to a mere man and is forced to change his ways. He is humbled many times on Earth but never more than when he fights his way to Mjolnir his hammer. There he is unable to lift the hammer that he has used for many years and his spirit appears to be completely broken. In his exile, Loki (Hiddleston) informs Thor that his father has died and his mother is unwilling to allow Thor’s return to Asgard. There are many great moments in this movie and Marvel continues to entertain on the grand level when it comes to this universe of movies. If you liked this try: Any Iron Man, The Avengers, Oblivion.